Printed brochures are a sure-fire way to promote your business and reach new customers. Brochures serve up key information about a new product or service, provide insight into your company and give customers something tangible to see, feel and take with them. Many people think of trifold brochures as the standard, but, in fact, brochures come in many different shapes and sizes, including sell sheets, product guides, flyers, menus, newsletters and spec sheets. There are four standard brochure sizes: 8.5 x 11, 8.5 x 14, 11 x 17, and 11 x 25.5. Choose a size that matches the quantity of information you want to get across. People react better to clutter free designs so don't try to crowd your information and images into too small of a space. Consider the staying power of the brochure when choosing a size. An 11 x 25.5 large fold-out full color brochure might serve as a mini product catalog and be kept at hand for years. An 11 x 17 half-folded provides four 8.5 x 11 "pages" and works well for a complicated product description which requires numerous images, graphs and text. Both fit nicely into a presentation folder for a professional look. Choose an 8.5 x 11 trifold or half-fold brochure for trade shows, mailers, take-out menus, event promos, or any other type of sales brochure when you don't need the additional space. 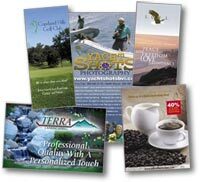 Commercial printers offer a wide array of choices when it comes to paper and finishing for your brochures. To create "richness", consider heavier weight paper and special effects like die-cuts or spot varnish to highlight images on the cover. If you plan to mail your brochure, it will pay to include aqueous coating. This gives the brochure a glossy finish and makes it more scuff resistant for protection as it moves through the mail stream. When creating a brochure design that will be mailed, always take into account how the piece will be mailed. Use our U.S. mail layout guides in the brochure size of your choice. These brochure templates incorporate USPS specific guidelines relating to tabbing, dimensional sizes, location and size of the address panel and postage. All may affect which mail class can be used and the cost of the mailing. Our experts are here to help you with your brochure mailing projects or find additional information online with our Mailing Services Guide. Even if you don't plan to mail your brochure initially, you may want to plan ahead for the possibility and include a mailing panel in your design. Our full service commercial printing and mailing service can always print extra brochures and hold them for future potential mailings. Brochures are one of the most versatile pieces in your advertising or marketing arsenal: sell sheets, product launches, flyers, menus, newsletters or spec sheets - a "brochure" can handle it all.